Karine Polwart's Wind Resistance was first performed at the Edinburgh International Festival last year, and now finds its way to Glasgow as part of this year's Celtic Connections festival. I had tried and failed to get tickets for it last year so was pleased to see it being revived. 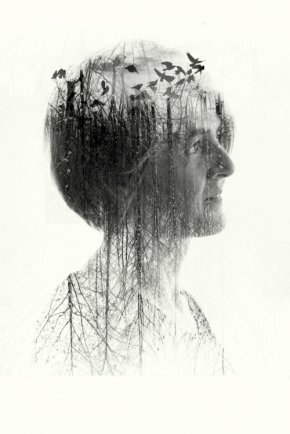 Written and performed by Karine Polwart, with input from David Greig and directed by Wils Wilson, Wind Resistance is a mixture of story-telling, folklore, traditional, and original songs all woven together around the musicality of Karine Polwart's voice. Twenty four hours on I am still digesting all that it contained. The starting point is Fala Moor in Midlothian, close to where Karine Polwart lives. From describing the vista that opens up in front of you there, to crouching down and inspecting the smallest moss over the course of 90 minutes she explores the inter-connectedness of land, people and society. The mixture of personal memories and the story of a couple who lived 100 years earlier on a farm close to where Karine Polwart now lives give a humane heart to the piece. The songs give the whole story a feeling that we are sitting around a campfire on the hillside hearing secrets and tales in the oral tradition, passed on to us. The skein of pink footed geese that arrive on the moor in autumn from Greenland are the visible proof of the benefits we can all gain by sharing the load. I laughed as that led us into an excuse to recall the Aberdeen's 1983 European Cup Winners' Cup winning team, as then manager Alex Ferguson is a big fan of that metaphor. Karine's enthusiasm for that team was shared by non-Old Firm supporting classmates of mine in 1983 who started following Aberdeen and Dundee United around that time (I stuck with Partick Thistle - whose laughing now?). It is also a story about womanhood and childbirth that manages to avoid any tired "mother Earth" tropes. The warnings about the current atomisation of the health service are clear. It is a humane piece and focused on the benefits we all get from society pulling together, looking after our wild sites and each other. Like the geese I was lucky enough to be in Greenland recently, where the effects of global warming are visible in front of your eyes, and not acting is clearly no longer an option. A timely warning against isolation and individualism. If you get the opportunity to see it, I would encourage you to grab it (and take a hankie). I think you have an extraneous 'not' in this sentence "It is also a story about womanhood and childbirth that manages not to avoid any tired "mother Earth" tropes."